The Lincoln MKX was introduced to the market in 2006. The MKX offers modern styling as well as a contemporary interior. The car lacks the third row seat making it less family-friendly than other sport-utilities, though its single-row backseat is spacious. 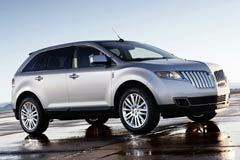 The Lincoln MKX has the same frame as the Ford Edge, though it has been slightly modified. The Lincoln MKX is designed in a uni-body way, as opposed to the body-on-frame model such as the Lincoln Aviator. The MKX came equipped with a 3.5L V6 engine, which has the ability to produce 265 hp. The car also came with an automatic 6 speed transmission that was made in partnership with GM. The Lincoln MKX car gets 25 mpg on the highway and 18 mpg in the city. The car was updated for the 2008 model year. 2016 MKX FWD 4DR RESERVE 2016 LINCOLN MKX, White Platinum Metallic Tri-Co with 69494 Miles available now!